The farmhouse is located on hill at 300 of height in a panoramic position and placed in the south. It is immersed in full countryside, surrounded by olive groves and vineyards. The place is very quiet, overlooking the less trafficated street and is about 3 km from Vitolini, the nearest village. The ancient rural house, surrounded with a big garden, has got 5 indipendent holiday apartments, restructered scrupolously in the tuscan architectural tradion. All apartments are located on ground floor and first floor. The apartments on ground floor have got part of the garden at their entrance, generously equipped with tables and chairs, those on the first floor instead have got a terrace and/or garden pergola. Each apartment is composed by livng room with kitchen, Tv, bedroom and private bathroom. Wifi is available and on free use. The breezy climate renders the area comfortable also in the summer. The outside terrace and vanishing-edge panoramic pool reserve breathtaking views of the Montalbano valley. Guests can enjoy an ample outdoor space, freshly covered with light colored canvas, that offers a barbecue and wooden tables and an equipped play area for the children. 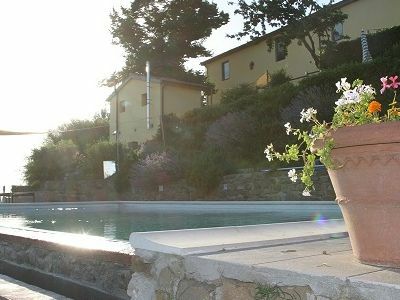 The agriturismo also offers a multifunctional room with washing machine, olive oil and wine sale, minibar, coffie machine and tourist information booth. the guest pets are welcome. Our farmhouse produces certificated biological extra vergin olive oil and from 2017 the farm has got the own oil mill that could be visited after reservation. The agriturismo promotes wine of the area. There are various restaurants at a distance of 2 km and there are many places to visit like Vinci, the birthplace of Leonardo. The Montalbano, protected area, surprising us with Etruscan excavations and a lot of small villages, fascinating to discover how for example Carmingnano, Poggio a Caiano and Artimino. Our area boast an extensive network of hiking trails, passable on foot or by mountain bike. Nearby there is the possibility to play golf and horse riding too. The spas of Monsummano Therme are just 25 minuts away by car, as well as a climbing garden.